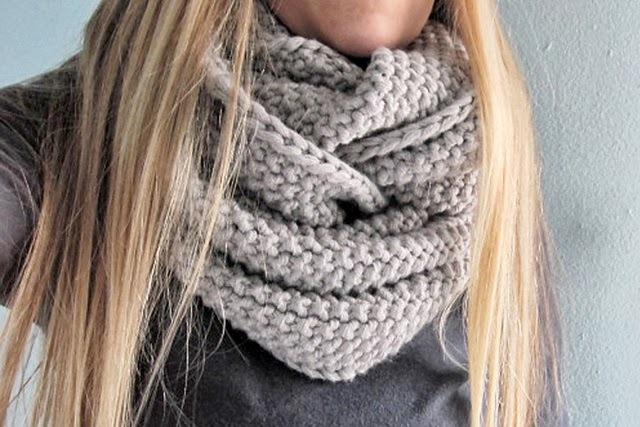 Cowls cowls cowls. They are everywhere. 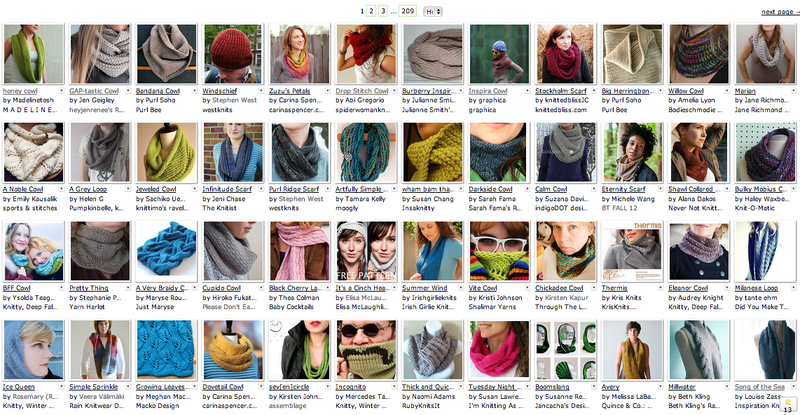 There are 12,667 cowl patterns listed on Ravelry alone... and honestly? My eyes start glazing over after the first 2 pages of them. I'm rather picky about cowls. I find that I'm never really warm if my neck isn't closely wrapped in fabric. So, those long rings that are super in-fashion present a difficulty. And if it's too short, you can't get it over your neck. Dilemmas! There's probably a magic math formula for length versus fabric stretch which would give the perfect personalized cowl ring length, but I'm not ready to go there. ... or the tight slip-on sort! 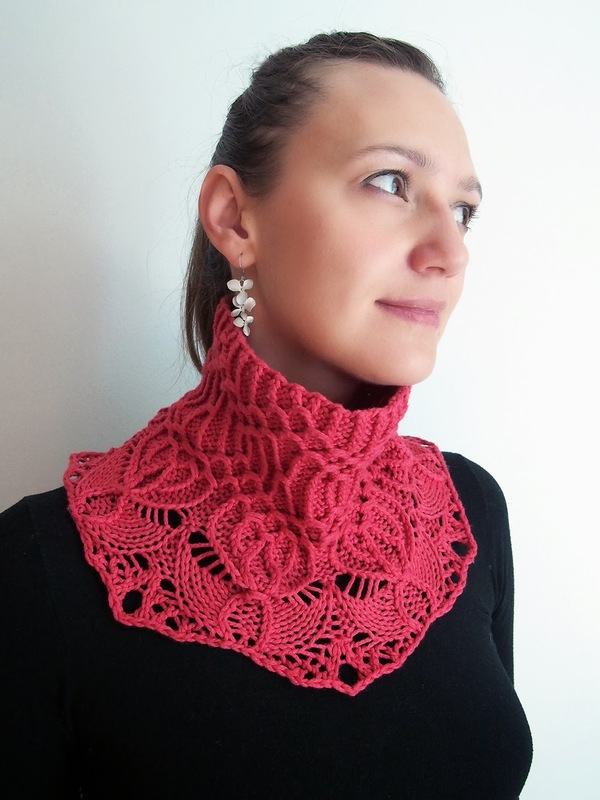 This is one of the reasons I fell instantly for the Vault Cowl Collar testing in my pattern testing group on Ravelry. 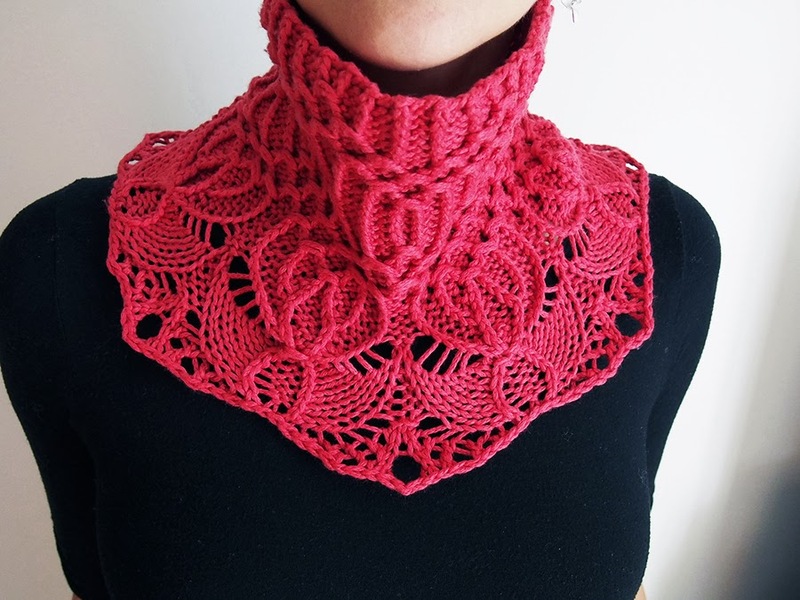 This pattern is by Lavish Craft (Jennifer Kirchenbauer). 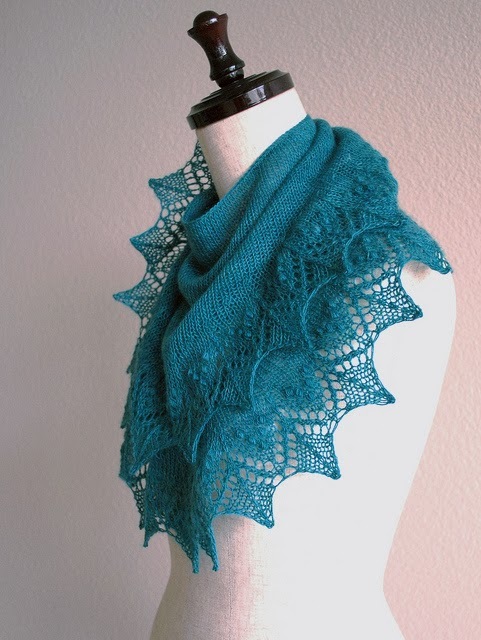 The other reason was the clever idea to make a cowl using the basic map of a shawl. The neck? Gorgeous traveling twisted stitches! The border? 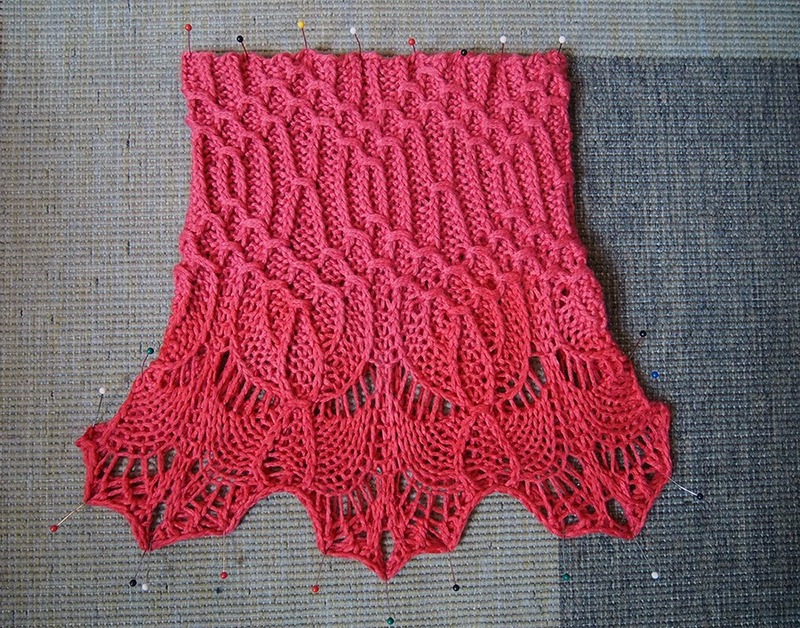 Classic shawl lace edging! 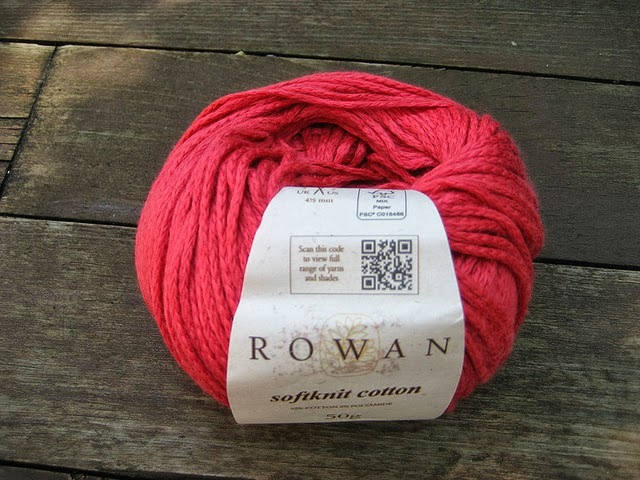 One of my pattern testing rules is to use up stash, and I had 1.4 skeins of some lovely stuff, a recent yarn released by Rowan called Softknit Cotton. As you all know, cotton is the ultimate yarn for stitch definition. The color is on the threshold between red and pink, I still can't decide what it is! This is a worsted weight chain construction yarn. It's 92% cotton, 8% polyamide, which probably helps it be machine washable. It's quite soft to the touch and is almost a bit fuzzy along the chain. 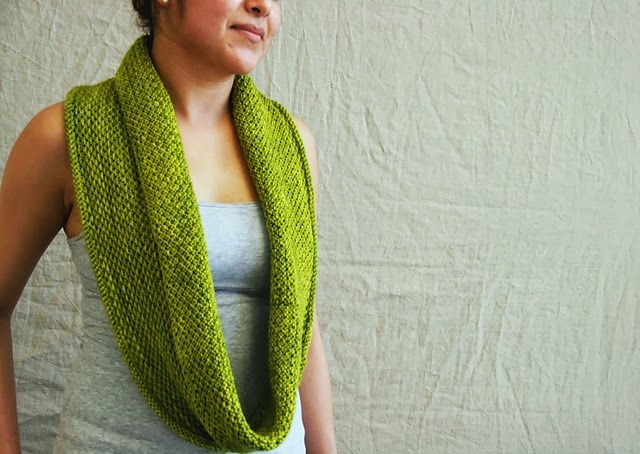 It is one of the more comfortable cottons I've knit with, and this actually means something. Knitting with cotton, especially heavy cotton, always stresses my hands. I think the problem is usually that it takes a lot of effort to move cotton along the needle, even with Addi Turbos. Two downsides to the yarn: 1) that fuzziness I was talking about it is really millions of cotton plies within each cord of the chain. It's actually pretty pretty easy to catch some of those plies by mistake with your needle, or with your hands while pulling at a stitch, and just break them. Rather odd, really. 2) The yarn seems to 'matte down' easily. What I mean is that any pressure on the yarn from the outside will flatten it down and replace shininess with matte-ness. I don't know how else to describe it, but it can manage to have an oddly plastered look that I don't see from other cottons. 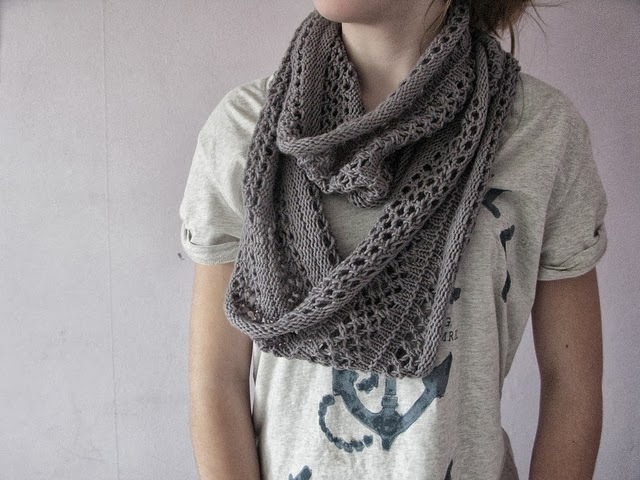 Man, but the stitch definition is even better than regular cotton, in my opinion, because of those nicely plied chains! This is the type of pattern you could really play around with, you know? 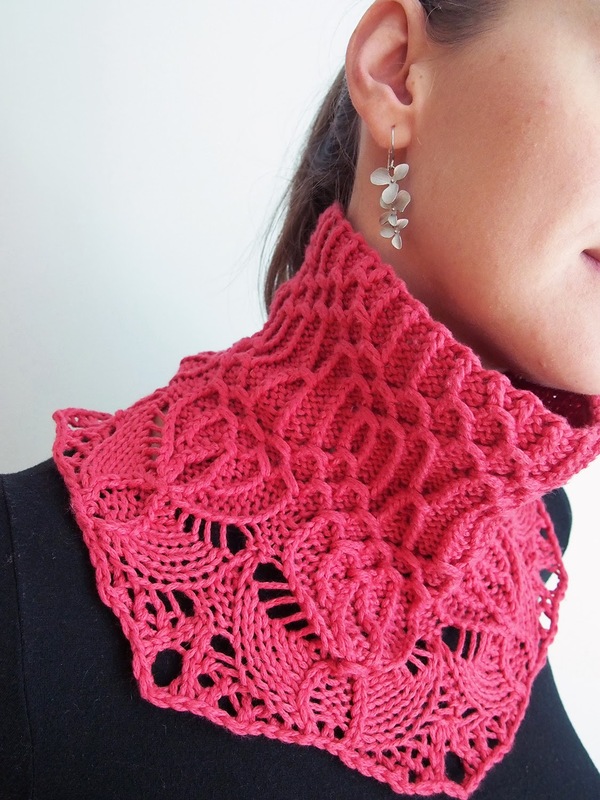 You could do this again and again, taking your favorite shawl patterns and adapting the edging to practice. You really want to block this baby well. 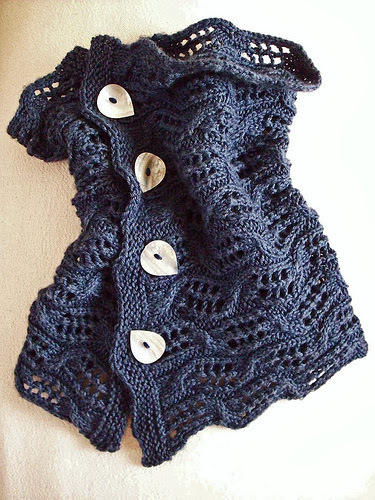 The designer gives nicely detailed blocking instructions in her pattern, with suggestions for pin placement. In the end, this was not the best yarn for the job. It feels great to wear (no itch!) 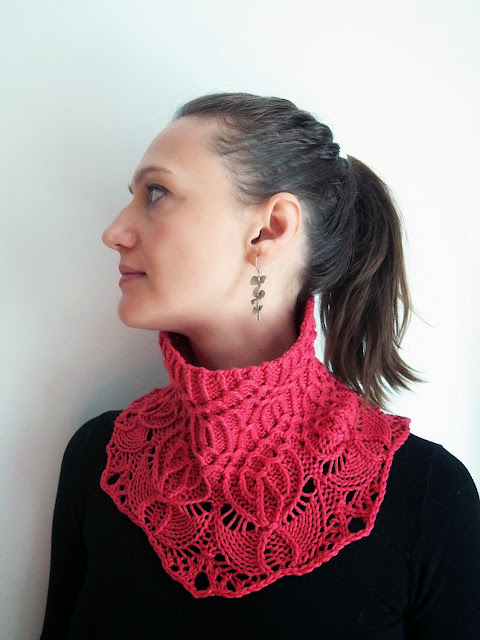 and the twisted stitches neck part is fab. However, within hours, the lace part had bounced back and lost its nice edgy shape. 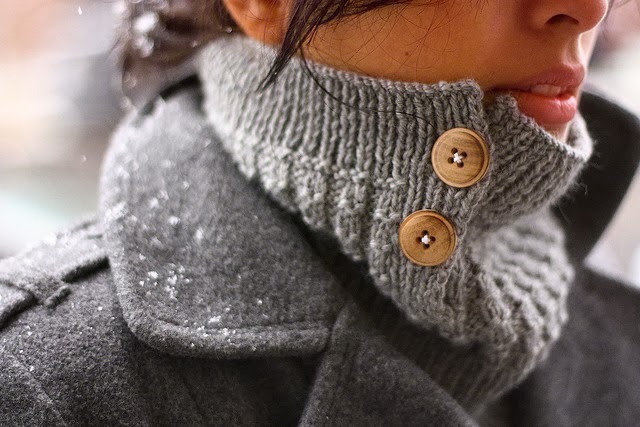 If you are interested in this pattern, I suggest a 100% animal fiber yarn to really keep that edge in place! Very interesting post. 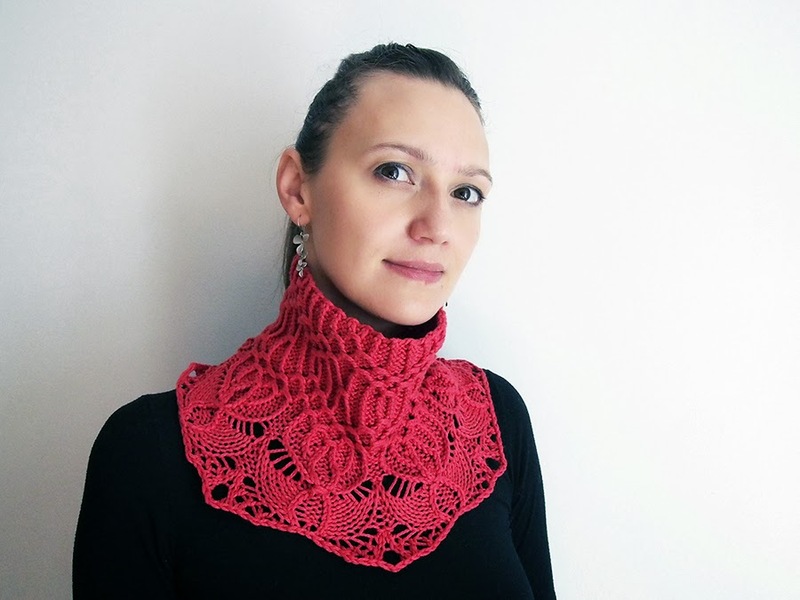 I've never really thought about cowls but maybe I should have a go at knitting one. Like you say a great stash buster! Great review of the yarn. I've never used cotton but after your praises regarding stitch definition I may have to give it a go. Yes, do give cotton a try... I like to use cotton and cotton blends for my summer tank top knits. I should make a cable-y tank top, it would be the best of both worlds for cotton. Yes, this would be a fantastic way to dive into the world of lace! Do tell me if you do the pattern. :) She has another one testing right now with a different border. So much to do!